Although I haven’t been a gamer since my teens, I was into video games big-time back then – and a front-line fanatic in the Sega vs Nintendo war. I was a Sega fanboy through and through, flying the white-and-blue flag in a country (Australia) where most kids owned Nintendos and, unsurprisingly, sided with what they had. I was no different, having been gifted a hand-me-down Master System from a family friend when I was about eight years old. But I’m not here to advocate. We all know that today, Sega’s just another third-party developer, making games for rather than in competition with Nintendo. Inconceivable and even blasphemous as it would’ve seemed back in the day, Sonic now runs side-by-side with Mario in games like ‘Mario & Sonic at the Olympic Games’. Their animosity is history. But I’m just setting a scene here – that for me, the subject matter of this book represents more than simply a passing interest or light escapism. It was one of the defining themes of my childhood. The book definitely delivers, telling the story of how former Mattel executive Tom Kalinske was poached by Sega to take on the industry giant Nintendo. Initially sceptical, he nevertheless took up the challenge, started slinging shots at his Goliath-sized rival, gaining ever more momentum and confidence until Sega became, for a time, the #1 video game company in America. The book also tells the inside story of the tension and rivalries within Sega itself, with Sega of Japan quashing and tripping up Kalinske’s American division that drove much of the company’s success. It’s a tale of ambitious risks taken and paying off, as well as tremendous opportunities served up on a plate but mind-bogglingly squandered. It’s a case study in the critical importance of prescient business development, effective marketing and a strong corporate culture. The problem is, the book was a tad too heavy on this side of things and overlooks what readers like myself are hungry for: indulging their nostalgia for the games themselves. Which is ironic, as it quotes more than once a Nintendo marketing executive’s very apt mantra: “the name of the game is the game.” The development and popularity of Sonic is covered in detail, but other Sega icons are nowhere to be seen. Alex Kidd, Sega’s mascot up until 1991, gets one off-hand mention, while classic characters like Wonder Boy, Shinobi and Opa-Opa don’t even register. Neither does Eternal Champions, Sega’s worthy answer to Street Fighter and Mortal Kombat, which is truly surprising given that Sega of Japan’s refusal to support a Saturn version of the ‘American’ game, on the grounds that it’d compete with Japanese Virtua Fighter, almost convinced Kalinske to quit on the spot according to other sources. The book’s other main problem is that it feels very much like a biopic of Tom Kalinske. While having a protagonist for the story is a fair move, I say ‘biopic’ instead of ‘biography’ because the author indulges his poetic licence to pen dialogue so frequently, and to such a degree, that at times the book feels like a movie novelisation. Granted, the rise and fall of Sega does have the stuff of a quality epic drama – good guy Kalinske fighting the good fight against his worthy adversaries at Nintendo, whilst trying to outmanoeuvre his inscrutable Japanese overlords. ‘Masters of Doom’, a similar book that tells the story of id software, often draws us into the moment as well, evoking what it was like in the irreverent, pizza box-filled rooms where Doom and Quake were forged – but the difference is, MoD gets the balance just right. Well-written though it is, ‘Console Wars’ gets a little bit carried away at times, with entire pages of conversation and thoughts written out like a screenplay – leading me to agree with a number of reviewers on Amazon that the author’s trying too hard to make his book readymade for a film adaptation. The most disappointing fact for me is that with its spotlight firmly on Kalinske, the book abruptly ends when he resigns from Sega and steps off stage, leaving you wondering what the hell happened next. From memory, the Dreamcast isn’t even mentioned, despite it being the most successful console launch ever up to that point and a revolutionary machine way ahead of its time – that, unfortunately, represented Sega’s last gamble before it put up the white flag and became a platform-neutral developer. 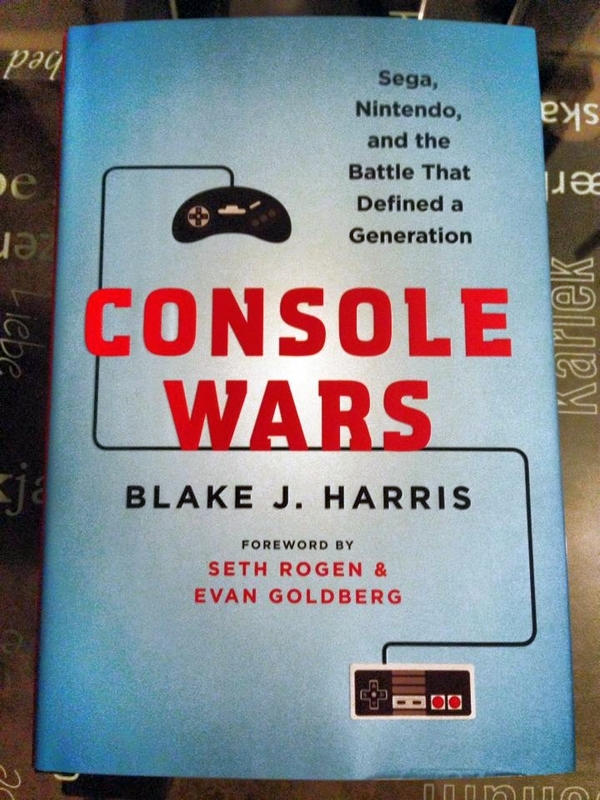 It seems strange to call a book ‘Console Wars’ then cut out the critical last few years that decided the fate of the war – literally akin to a book on World War II that ends with the Allied invasion of Normandy. It’s unexpected, unsatisfying and the book would’ve been a far greater piece of work if it had seen the saga through to its end in a couple more chapters. Unusually, the book also oscillates in how it presents its protagonists. Mostly it’s a tale of Sega the underdog sticking it up the sleeping giant Nintendo and hurtling, Sonic-style, to temporarily become market leader. While the author never takes sides as such in documenting the rivalry, there’s a distinct undertone of sympathy and admiration for the Sega crew throughout the first two-thirds of the book. Then he seems to do an about-turn, quite suddenly, as if deciding that now that Sega’s made it and Nintendo’s on the back foot, we’ll bathe Nintendo in a positive light and shut down the new tall poppy. Sega go from being cheeky, gutsy upstarts to slightly contemptible opportunists that favour style over substance, while the big bully that insisted on unequal contracts and starving its competition of developers becomes good ol’ Nintendo once more, familiar and wholesome like apple pie, saviour of the video game industry, committed to extending consoles’ lives (unlike Sega, always spreading itself thin with new-fangled technologies) and making solid family-friendly games. It’s kinda jarring at first. Books rarely change their narrative like that – especially so late into the tale – and there’ll undoubtedly be readers who go ‘Hey, what the? Why so down on Sega now?’ – which was my initial reaction too. But then I remembered the author’s spent a fair bit of ink taking the wraps off some of Nintendo’s questionable practices, and fair’s fair. For us 90s kids battling in the classroom and on the playground, this was an emotive, subjective war and it’s healthy to look back now – grown-up and objective, open-minded instead of blinkered – to see the other side of the story and accept that, whether your virtual hood used to be Floating Island or the Mushroom Kingdom, both companies were unquestionably passionate about video games and both did their best to be… well, the best. Overall I liked the book, definitely. It’s well worth a read by any old-school gamer, or even anyone interested in a fascinating case study of business and marketing that can be seen repeating itself today, with such tech rivalries as Playstation vs XBox or iPhone vs Android. Indeed, one could even argue that there are similarities to Walter Isaacson’s 2013 biography of Steve Jobs (which I blogged about here), with Kalinske playing the role of Steve – a charismatic, motivating leader with a finely-honed penchant for selling the product – leading a ragtag but spirited bunch of ‘pirates’ against the entrenched monolith of IBM. If Nintendo saved the video game industry in the early 80s, Sega ensured that it didn’t stagnate but kept evolving – at Sonic speeds – in the early ’90s, both through its own innovations and by giving Nintendo such hefty competition to do better. Again, I do feel though that while it makes sense for a Steve Jobs bio to end with Jobs’ death (not to mention it was published mere months after the event, as opposed to more than a decade later), Console Wars should have kept going until 2001 when Sega announced that it was Game Over for its hardware business – bringing an end to that epic struggle for the hearts and minds of all us 16-bit gamers. This would’ve also allowed the author to indulge some further analysis that explains Sony’s dominant position today, such as that Sony essentially copied Sega’s formula and beat them at their own game – undercutting on price and ‘out-cooling’ them on the marketing front, with Crash Bandicoot doing for the New Challenger what a similarly anthropomorphic mammal with attitude did for his own up-and-coming company several years earlier. All things said, ‘Console Wars’ is a solid, impeccably researched read that definitely brought back memories and offers some incredible revelations into what was going on inside Sega, Nintendo and the whole video game industry at the time. As for the games themselves… hopefully this Kickstarter will deliver where Console Wars was a little light.